The next generation in estimating software has arrived! On-Site Estimator leads the way into the field of portable estimating and quotation systems. Imagine the savings in time alone when you can do the takeoff, produce the quote to the customer, accept the order and credit card payment all at the job site with one trip! Extensive lists of products and their specific ations, organized by brand and type, are further enhanced with up-to-date information on list and retail costs, inventory and availability. Labor costs, based on individual products, are factored in. Customer data includes detailed contact information as well as special notes or reminders. Built-in flexibility allows you to track custom or one-of-a-kind products, as well as a wide range of miscellaneous items such as tree removal, cleaning and delivery charges. 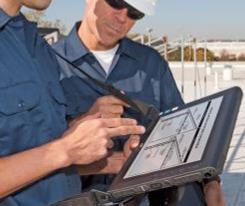 An intuitive interface makes learning to use On-Site Estimator simple and straightforward. Versatile reporting enables integration with many other software applications including your Point of Sale. OSE includes modules for Millwork, Paving, Fencing, Suspended Ceilings, Drywall and Insulation.